This book is an interesting mix of things. The story is somewhat traditional in structure but with odd moments and characters that make it seem fresh. 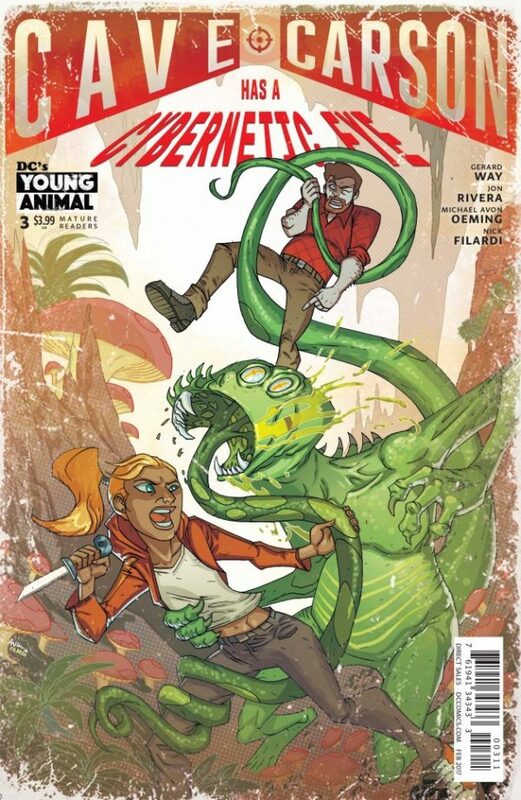 The traditional characters from the original Cave Carson comics are sort of familiar, but with equally odd variations, like the cybernetic eye of the title. This time we finally have Cave and his daughter (with Wild Dog, for some reason) finally in the mole car heading underground (always the best thing in the original comics) here being chased by a monster and another mole car. The art by Michael Avon Oeming is pretty cartoony, so it’s kind of like seeing the story through a Saturday Morning animation filter. It works at times, though on occasion the simplified art style fights the story for me. But mostly it’s a fun read and it keeps me entertained and wondering where it will go next. This entry was posted in Comics, Reviews on February 27, 2017 by Todd.